What is your Coal type? What are the specs of your Coal? What is the difference between ROM Coal and TPC Coal? ROM or Run of Mine Coal is the raw coal that is mined out of the mine pit. About 80% is Clean Coal and the remaining 20% is Washable Coal. Washable Coal is washed in the Coal Washing Plant to get rid of contaminants, with a 60% average recovery. The combination of Washed Coal and Clean Coal becomes the Total Product Coal or TPC. What is meant by strip ratio? It indicates the ratio between waste moved in cubic meters for every metric ton of coal produced, such that a 10:1 strip ratio means 10 cubic meters of waste materials are hauled to produce 1 ton of coal. What kind of mine are you operating? We are operating an open-cut coal mine. Not only are we the biggest producer of coal in the country, but we are also the only open pit mine in the Philippines. What are the other resources in the island of Semirara? Do you have the permit to mine them? Apart from coal, Semirara island has about 824 thousand tons of silica, 1.2 billion tons of limestone, and 2.9 million tons of clay. Yes, we have the exclusive right to explore and mine these reserves. Our present permit grants the company the exclusive right to explore them. The company has the option to convert the permit into a Mineral Production Sharing Agreement (MPSA). The MPSA grants the company the right to mine these other resources. What rights does the Coal Operating Contract grant Semirara? The contract gives the company the exclusive right to conduct exploration, development, and coal-mining operations in Semirara Island until the year July 2012. On 13 May 2008, the Department of Energy granted the company’s request for a fifteen (15)-year term extension of its Coal Operating Contract. The company’s right to mine in the island is extended up to 14 July 2027. What happens after your contract has expired? DOE expressed in its formal notice to us on 14 July 1995 that if necessary, an extension or a new operating contract may be granted upon filing of an application for extension a year before the expiration of contract. We of course intend to apply for an extension and we do not foresee any problem getting DOE’s approval. What is the total coal reserves of Semirara Island? In 2006 Australian consultants supervised confirmatory drilling activities in the Panian Pit in accordance with the Joint Ore Reserve Committee (JORC) standards of Australia (an internationally recognized body for establishing mineable reserves). As at 31 December 2006, 62 million MTs of coal were classified as measured and confirmed, while additional 24.5 million MTs and 6 million MTs were categorized as indicated and inferred, respectively. What is your annual mining capacity? What are your expansion plans? Currently, our annual capacity is 4 to 4.5 million MTs ROM coal. We are planning to expand by 500 thousand MTs/year until we reach 5 million MT-capacity, which is the maximum limit of present infrastructure capacity at the Panian Mine. When are you going to open Himalian mine? There are two events that could drive the opening of Himalian mine: when demand for local coal exceeds 5 million MTs per year or when the demand for cement goes up to justify putting up a cement plant. The ideal set-up in opening Himalian mine is to put up a cement plant right beside the pit since the overburden of Himalian is mainly limestone and silica, two major components of cement. What is meant by DOE share? How is it computed? Minimum DOE share is 3% of Coal Revenues. What are the allowable deductions for the computation of DOE share? What happens if the allowable deductions for the period exceed 90% of revenues? What taxes do your company pay? By virtue of Presidential Decree 972, otherwise known as the Coal Development Act, we are exempted from paying all taxes, except income tax. Right now, as a Board of Investments-registered company, we enjoy Income Tax Holiday up to September 2014 for our current operating mine, Panian Pit. Local buyers are composed of power plants, cement plants and other industrial plants. We have also started to export to China and India starting February 2007. Most of our export sales now are to China. Mainly suppliers of imported coal. 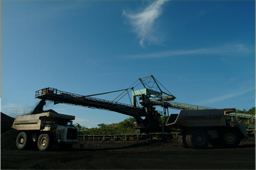 More than 90% of total coal production in the country is produced by our company. What is your ownership profile?